Very high quality waterproof DCF binoculars. The Freebirds feaure a tough rubber body, the lenses are fully multicoated and the BaK-4 prisms feature NATUREPHASE coating in addition the optics are manufactured using high grade roof prisms and lenses for great clarity and colour. The Visionary Freebirds are fully waterproof and have twist up/down eycups which make them easy to use for both spectacle and non-spectacle wearers. The image on the Freebirds is excellent, when we first saw them, we expected the price to be around £200 (if not a bit more). 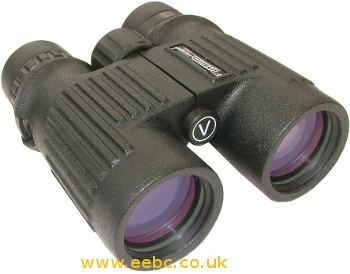 The 8x42 are ideal for birdwatching and general nature observation. Includes case, strap and 10 year manufacturers guarantee. 24/03/2011 19:26:21 I came and bought a pair of these from you, thank you so much for your help and advice - and for showing us what seemed like hundreds of binoculars. We have sice been on our safari and we were most impressed by the Visionary binoculars, as were some fellow holiday makers on the tour bus! Thank you, we shall not hesitate to recommend yourselves and Visionary binoculars when we get the chance. 26/03/2011 11:34:34 Thank you for your comments. Everyone who comes and looks through them are most impressed, it is just a pity that all those people who phone us and ask for a recommendation, do not seem to believe us when we recomment the Freebirds.